Detox 3 Ways Without the Boring Juice - My Fitness Closet! Top Quality Apparel! Want to jumpstart your weight loss? For sure juicing came to your mind. A juice diet, taken for a time, boosts your body’s immunity and keep your skin glowing. But perhaps, another good thing that juicing brings to your bodies is that it aids in detoxifying it with harmful chemicals that have accumulated. Not only that, since food must be digested properly for the body to fully utilize its benefits, juicing takes that work of from the body and nutrients are absorbed easily because it comes in liquid form. However, not everyone could stand a few days of drinking juice alone. Aside from the hunger pangs it would surely cause, taking juice for a certain number of days could also bore one’s taste buds. But detoxifying the body is not only limited to juicing. Listed below are some healthy alternatives to juicing that one could benefit from. If you cannot stand drinking just juice for five whole days, increase the fiber in your daily food intake. There are two types of fiber – soluble and insoluble and both are necessary to keep your body healthy. Soluble fiber combines with fatty acids in the body to slow down digestion. This way, blood sugar is introduced into the body at a slower pace, which regulates sugar levels in the body especially for those who have diabetes. It is also helpful in keeping cholesterol levels low in the body. On the other hand, insoluble fiber helps the body be hydrated so that waste is able to move easily in the intestine to regulate bowel movement. It also aids in balancing the pH levels in the intestines. Foods from whole grains contain the two kinds of fiber so it’s best to add this kind of food in your daily diet. This type of bath is not only soothing and relaxing but it also aids in ridding the body of toxins. The skin is the largest organ in the body to secrete waste through sweat. One could encourage detoxification of the skin by taking baths with Epsom salt or magnesium sulfate that helps draw out the body’s toxins via the skin. 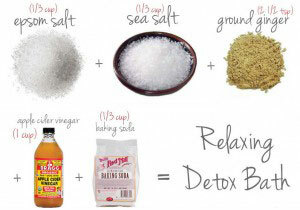 Just dissolve a few tablespoons of the Epsom salt in a tub of lukewarm water for a relaxing bath. Massages are not only used for soothing tense muscles and joints. It has also been utilized for centuries to encourage proper activity in the nervous, lymphatic, circulatory and musculoskeletal systems of the body. The pressure helps the blood in the body to flow and break down toxins that have accumulated. Foot massages is one of the best ways to stimulate blood flow in the body as numerous pressure points that affect each part of the body is located there.